Cotton candy is a popular food at carnivals and amusement parks. Truly, this is just a form of spun sugar with specific taste, but bright color and delightful taste make it so popular and it brings sweetness and joy to the life of children and adults. However, sometimes, life is just like cotton candy, which seems sweet and tasty but it is easy to destroy and fly. 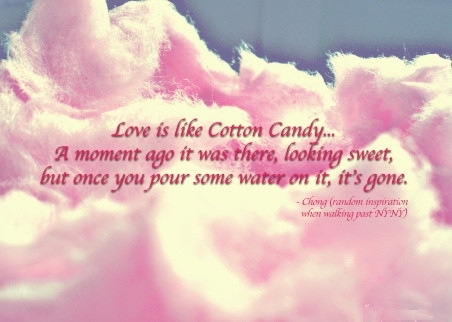 Read 25 cotton candy quotes to find out more about it. Be fluffy as a cotton candy. A picturesque and marvelous view. Take a day off from everyday routine. How funny it is to see this! A cotton candy can brighten the mood. A delicious candy is a symbol of childhood. Enjoy the sweetness of a cotton candy. Sweet moments are always short. Pamper yourself with a cotton candy. A recipe of a happy life. Cotton candy brings us lots of joy. A true secret of optimistic life. Enjoy the sweetness of cotton candy. A cute cotton candy creates a brilliant mood. Do you like this snack? A cotton candy is a fluffy mystery. Spun sugar is a popular treat. Live a life with sweetness. Sugary food can be useful. A provocative kind of question. If it is raining, take a delicious treat. Enjoy a sweet dessert with 25 cotton candy quotes.